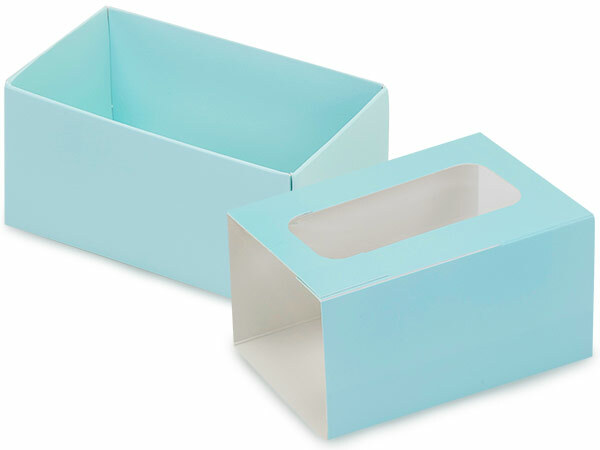 Each 3-3/4x2-1/2x2" Aqua Macaron box set includes: 10 bases and 10 sleeves. Macarons are a popular treat for all kinds of events, from birthday parties to more upscale events. These confectionery delights require a special packaging to properly display these unique desserts. Nashville Wraps offers durable macaron boxes to help keep your treats fresh and beautiful until your customers or guest are ready to devour them. Our macaron packaging is available in prepacked sets, or sold separately so you can mix and match colors! The macaron set for the larger two sizes includes a tray for holding your macarons upright and steady in the box, a box base and a sleeve in matching colors. The small size macaron set includes a box base and a sleeve in matching colors. These boxes are also great for gift or favor boxes! The slide out design makes these boxes a unique packaging option! Each box also comes with a window in the sleeve, so anything you choose to put in the box will be on full display for the guests at your event or in your shop! Pair with our baker's twine for a petite bow, or make a statement with a custom printed ribbon!